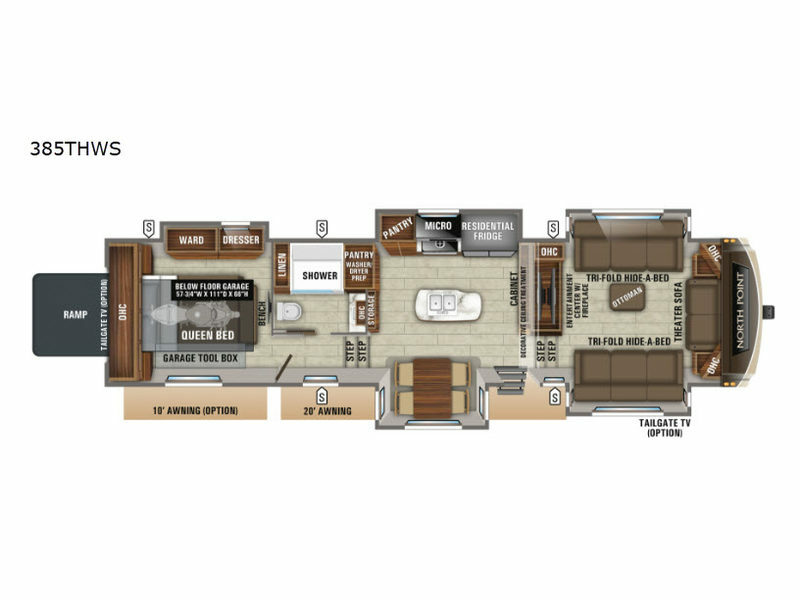 For your next camping trip, you won't have to rent your off-road toys when you get to your destination because this North Point toy hauler fifth wheel will let you bring along your own! This model features a unique layout with its below-floor garage giving it the feel on the interior of a luxurious fifth wheel yet maintaining the storage capacity and convenience of a toy hauler. Throughout this model you will find plenty of floor space because of the five slides that have been included, and with the help of the One Control Digital Command system, you will be able to control those slides with the push of a button. This entire unit will remain bright and cheerful even on the darkest of days with the LED lighting that has been included throughout, and the 8' 11" arched ceiling will let you feel as if you're in your own home.